Sais was Egypt's capital in the 26th Dynasty, but it also had an earlier history, unknown before the EES/Durham University/SCA work at the site. This volume is the final excavation report for work carried out in the Northern Enclosure area of the site at Kom Rebwa, funded by the British Academy through the Egypt Exploration Society and the Arts and Humanities Research Council. 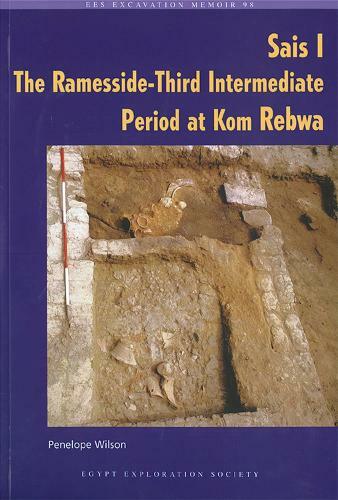 Excavations between 2000 and 2004 uncovered levels dating between the 20th Dynasty and the Third Intermediate Period. The best preserved levels consisted of part of a house, whose roof had collapsed and an earlier kiln, used for firing faience beads as well as pottery. Lower, buried layers also included Old Kingdom material, hinting at the earlier history of the area. The report contains invaluable information about everyday rural life in the Delta, with anlayses of the different layers, the pottery and the small finds, as well as plant remains and animal bones.